The budget for fiscal 2012-13 is expected to focus on increasing revenues including a hike in excise and service taxes as well as unveil measures to track unaccounted income, curtail subsidies and kickstart reforms to push growth in the infrastructure, agriculture and social sectors, according to analysts. Starbucks Corp said it will open its first outlets in India in August or September and plans to have 50 stores in operation by the end of the year in a equal joint venture deal with Tata Global Beverages. The petroleum ministry has asked Reliance Industries Ltd to immediately withdraw its arbitration notice against the proposed move to curtail cost recovery at its KG-D6 gas fields, saying "as on date" there was no cause for such action. The Bombay Stock Exchange Sensex slumped 2.15% on Monday, its sharpest fall in about six weeks, ending a six-session rally as investors booked profits after concerns over growth in Asia's third-largest economy resurfaced. The country's largest lender, State Bank of India, said Monday the government has approved capital infusion of Rs 7,900 crore in the bank, a development that will help the lender to increase its business activities. Despite all the controversies surrounding the telecom sector in the country over the last year, the industry still remains one of the most successful which has also been attracting fair amount of investment. 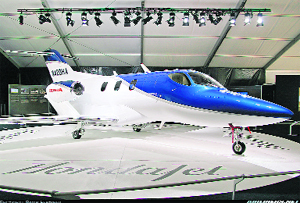 Honda Motor Co expects to grab at least a quarter of the world market for small business jets soon after delivering its first aircraft next year, achieving the company's long-standing goal of taking to the skies, an executive said. Toyota Kirloskar Motors Ltd is betting big on India. The Japanese auto major not only sees the Indian car market grow exponentially but is also looking at more investments in the country, besides sourcing a number of parts from its Indian suppliers. According to a Citigroup research note, following the Uttar Pradesh elections, a key signpost that investors are looking to in the coming months are measures in the FY13 budget, scheduled to be announced in mid-March. With a slippage in the fiscal deficit, the budget could likely see a focus on revenue enhancing measures. On the indirect tax front, reforms that align with the introduction of the goods & service tax (GST) are widely-expected to be on the agenda. Given that draft GST legislation still requires consensus on a number of issues the GST will likely be implemented in 2013. Nonetheless, measures in this year’s budget could include a gradual increase in excise duties/service tax to pre-2008 rates and pruning exemptions. A negative service tax list is also on the anvil as an empowered committee of state finance ministers recently agreed to this to ensure broadbased coverage, wherein all services except a few defined under the negative list would be taxed. On direct taxes, Citigroup report says that one could expect some clarity on the timeline for implementation of the direct taxes code. This was slated to come into force from April 2012 but is likely to be delayed as it is still under consideration with the standing committee on finance. Nonetheless, one could see steps to curtail benefits through tax havens or measures to track unaccounted income like making declaration of overseas assets mandatory and amnesty schemes. The expenditure measures could include steps to curb subsidies as curtailing the bloated subsidy bill is likely topmost on the government’s agenda. Apart from the widely acknowledged possibility of the Food Security Bill being implemented during the budget, an area that needs most attention is fuel subsidies. While the deregulation of petrol subsidies last year has helped, oil companies are making major losses on diesel and the cooking fuels. For streamlining expenditure, on the anvil is implementation of the BK Chaturvedi committee report on reducing the number of centrally sponsored schemes and possibly revisiting the classification of expenditure — both plan and nonplan. On the reforms front, the report says that the policy paralysis that has been seen over the last 18 months is beginning to see some fragile signs of recovery. However, given the numerous false starts last year, investors and companies are looking for things to actually happen, rather than get misled by ‘false starts’ as they did in 2011. The note says some some positive reforms in the budget would help improve investor sentiment. On infrastructure development the steps could include FDI in retail or aviation, resolving the poor health of state electricity boards and expediting land acquisition and environmental clearances. There could also be measures to boost infrastructure financing like permitting banks to sell taxfree infrastructure bonds and some respite for NPAs in the power sector. In the agricultural and social sectors the reform moves could include amending the APMC Act, decontrolling sugar prices, incentives for cold chain/farm supply chains, SME lending, affordable housing, drinking water facilities, irrigation, flood management, welfare of minority communities and those living in hills and the country’s northeast. Starbucks Corp said it will open its first outlets in India in August or September and plans to have 50 stores in operation by the end of the year in a equal joint venture deal with Tata Global Beverages. The formal launch of the company's retail foray into India comes a year after it signed a deal with Tata Global to buy coffee from India and open retail outlets in the country. Starbucks and Tata Global, part of the salt-to-software Tata conglomerate, said they had formed an equal joint venture to run cafés and develop business in India. The joint venture, Tata Starbucks Ltd, will set up Starbucks outlets across the country, starting with New Delhi and Mumbai, the partners said. Starbucks opted for a partnership even after the Indian government eliminated restrictions on foreign investment in the single-brand retail sector earlier this month. Tata Coffee, a unit of Tata Global, said separately that it had signed a deal to supply coffee to the joint venture. India is the world's fifth biggest coffee producer, but now exports 70-80% of production. Western style cafés are popular with an increasingly urban population in India, where tea has traditionally been the beverage of choice. The organized coffee market — which reflects consumption mainly through cafés — accounts for about $140 million of the country's annual coffee sales of about $667 million. Partha Sarthi Das, director in the ministry’s exploration division on January 25 wrote to RIL executive director P.M.S. Prasad, saying: "As on date", no dispute has arisen to warrant arbitration and the company should withdraw the notice invoking arbitration forthwith, ministry sources said. RIL had on November 24, 2011, slapped the notice upon learning that the ministry was moving to restrict cost-recovery in the KG-D6 block after flagging gas production led to utilization of less than half of the 80 million cubic metres per day of infrastructure the company had built. 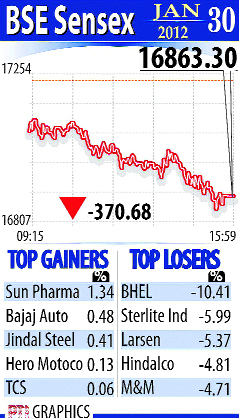 Lender ICICI Bank , energy major Reliance Industries, power equipment maker Bharat Heavy Electricals Ltd (BHEL) and engineering conglomerate Larsen & Toubro led the losses. "The market had forgotten many negatives while it was rallying. The worries are now coming back," said Jagannadham Thunuguntla, head of research at SMC Global Securities in New Delhi. The main 30-share BSE index ended down 370.68 points, or 2.15% — its biggest percentage fall since December 16 — at 16,863.30 points, with 25 of its components falling. It touched its highest closing level in 11 weeks on Friday. "The catchup is now over. We have become the best performing market in the world from the worst last year. Now we’ll move in tandem with the global markets," said Arun Kejriwal, strategist at research firm KRIS. The capital infusion will "increase the issued capital by SBI by way of preferential allotment of equity shares to the government to the extent of approximately Rs 7,900 crore including premium," SBI said in a filing with the BSE. Increasing competition and the government scanner not withstanding, reports emerging from the market suggest India’s telecom sector saw capital expenditure by telecom operators rise by about 20% in the year at $7.5 billion from $6.24 billion last year. Reports said as a result of the investments made the telecom operators in introducing the third generation 3G mobile phone services in the country, the mobile capital expenditure rose to $6.02 billion in 2011 compared to $4.67 billion last year. However the capital expenditure investments in the year just gone by are significantly lower than their capital expenditure in 2009. 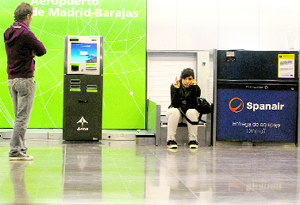 Telecom operators spent $10.11 billion for adding infrastructure in 2009. Reports said India’s top service provider, Bharti Airtel, led the group in capital expenditure in 2011 by investing $1.67 billion, followed by the world’s second largest telecom operator, Vodafone, which is said to have invested $1.4 billion in improving infrastructure in the country. In the cellular sector, Vodafone invested $1.4 billion as compared with Bharti Airtel's $1.2 billion. The latter increased its capex to $1.67 billion in 2011 from $1.55 billion in 2010. Idea Cellular and Reliance were the other big spenders, investing greatly in improving their infrastructure. Honda, Japan's no.3 car maker and the world's biggest manufacturer of motorcycles and engines, is in the final stages of getting its $4.5 million HondaJet certified. It aims to ramp up the pace of production to 80 a year in the first half of 2013. Honda received more than 100 orders for the seven-seater jet in three days when it began taking orders in 2006, promising a quieter engine, 20% better fuel economy over competing models and operational costs of two-thirds or less. It has not disclosed an updated number of orders, but Michimasa Fujino, a Honda executive and CEO of its North Carolina-based subsidiary, Honda Aircraft Company, said it held a backlog of about three years from orders taken through its nine dealerships in North America and Europe. "I'm very optimistic about our prospects," Fujino, who initiated Honda's foray into aviation research in 1986, told a small group of reporters at the automaker's Tokyo headquarters on Monday. "We're doing with HondaJet what the Civic did to American cars from the 1960s. Our competitors are still producing with technology from the 1990s," he said, referring to Textron Inc's Cessna and Brazil's Embraer SA, which now dominate the 200-a-year small business jet market. The Civic, known for its reliability, durability and mileage, has consistently been among the United States' best-selling cars since its launch in 1973, forcing industry giants such as General Motors Co to follow suit with cars to meet the country's tighter emissions regulations. Honda's ambition of making jets traces back to its iconic founder, Soichiro Honda. The HondaJet will make Honda the only car maker in the world to build its own aircraft. Its engine is made by a joint venture between Honda and General Electric Co.
Honda Aircraft is aiming to turn a profit by 2018, Fujino said. BRAZIL, CHINA CLAMOURING FOR JETS: The business jet industry is expecting a rebound in sales this year after the global economic crisis hammered sales over the past three years. While the small business jet market has traditionally been limited to North America and Europe so far, Fujino said he was fielding about a call a week from China, both from prospective buyers and eager dealers, while interest was also greater than he anticipated in Brazil, India and the Middle East. This year Toyota, will also be launching an improvised version of it luxury sedan, Camry. It is also expected to launch the Avanza in India later this year. Earlier this month the company launched new versions of the Fortuner and Innova, at the Delhi Auto Expo. Sailesh Shetty, the company’s vice-president (sales), told The Tribune: “In 2011, we sold 131,388 units in India, registering a year-on-year growth of over 70%. This growth was mainly because the Etios and Liva models that we launched last December caught the public fancy and we sold 63,500 units. But this year, too, we are expecting a good growth of 40%, across all product segments. We’re hopeful of selling over 180,000 units in 2012 and besides Etios and the Liva and Innova will continue to be the growth driver for us,” he said. Toyota plans to set up a Rs 500 crore petrol engine plant as well as a new transmission plant in India. The company The company already has a good vendor base in India and is looking at sourcing various parts from these vendors for its plants in Southeast Asia. “By the end of this year, we propose to add another 37 dealerships to the existing 173 in the country, taking our sales and dealership network to 210,” Shetty said.